There’s a bunch of rules that go along with talking about dwarves. I couldn’t be bothered to look them up. If I remember correctly, dwarves is the accepted spelling for the plural of dwarf, when refering to the fantasy race. When talking about a group of people afflicted with dwarfism you use dwarfs. I’m not sure what dwarfs like to be called. I’ve heard “little people”, but I don’t think that’s really a step up. I know nothing of the worlds of men and dwarves. And apparently, neither does firefox because it says dwarves is bad. “Little people” sounds kind of insulting to me. I think “short people” in more accurate and politically correct. How about “people”? After all, size doesn’t matter… at least that’s what the women in my life keep telling me. whoops! forgot to leave my name in the above comment. I’m not anonymous, I’m not anonymous at all. Crave: Our dwarf is a very, very, very, fine dwarf. Just wanted to say, in no insulting or mean manner, the above is LIES. -.- Wherever you heard it, discount the source. The technical plural of “dwarf” is “dwarfs”. J.R.R. Tolkien used “dwarves” in his style, just as he invented “orcs”. When printing it, the editors changed it as a typing error to “dwarfs” as well as “elven” to “elfin” Though elven is now an accepted word in our language today (except Microsoft Word still hates it along with “elves” =P) I can’t recall the whole “Note on the text” but that’s about the gist of it, along with revisions and recalls and such. And about the son, Christopher. 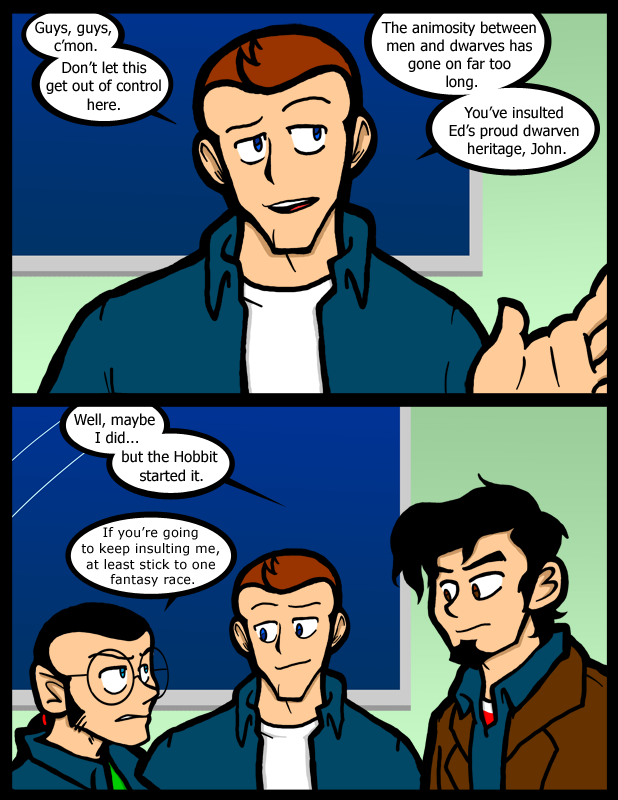 I totally called the hobbit joke last page. Haha. Being about 6’3″ myself, I know how to call the short jokes. Dwarves is the accepted pluralization of Dwarf as a fantasy race with many writers and game designers. As a living language and such, it’s just a matter of context and personal opinion. There’s no friggin’ god of grammar and spelling (no matter what your High School English teacher may say about him/herself), and you won’t get struck down for it. Chastised maybe, but I doubt that there’s a level of the Abyss reserved for people who improperly spelled received. And yes I know about my multiple sentence fragments, I just don’t care. shot again… will they even let him get up? He’s such an adorable dwarf, though! Both Games Workshop and Discworld use Dwarfs as the plural for Dwarf. That is because Discworld is from Pratchett’s unique view on the world and Games Workshop . . . . . is dumb. Sorry, had to be said. They are more of a dumb company trying to make money off a field than a part of that field. Dwarves are the fantasy race, accept no imitation!! I’ve always thought of the word “dwarves” and “dwarfs” as interchangeable depending on the author’s preference (Microsoft Word even accepts both). Would you all just read The Hobbit and LOTR already? Tolkien, being a linguist, said specifically in the introduction that the correct English plural of dwarf is dwarfs, but goes on to say that he uses the spelling dwarves when referring to Gloin’s race, who have absolutely nothing to do with those afflicted with dwarfism (and they look nothing alike either). And Crave, the correct spelling is “holbytla”, with two l’s, from what I believe is Old English for “hole dweller”. (Oh fudge, now my geek is showing agani) Great comic by the way, loving every update! I hereby endorse this comment. Don’t forget The Silmarillion. Seriously does nobody care about how the world was created? It was sung into being. The guide to middle earth. Doesn´t anyone else care about how much of their time is spent looking things up? I mean, yeah, I read The Hobbit and TLotR, but one re-read to find some obscure reference was one too many. So after the fifth or sixth of those, I found the guide, and have been very happy with it. Plus, it lets me reference things out of that one Tolkien book that was too textbooky for me to get very far into, let alone through. lol he says this to the guy with the hot sister he wants. Thank god for self awareness and being able to remember the errors of IE. Ah-ha! I get it… a step up!